Why don't those glasses have shadows, you may be wondering. Well, we actually took this picture in space so there wouldn't be any shadows. OK? 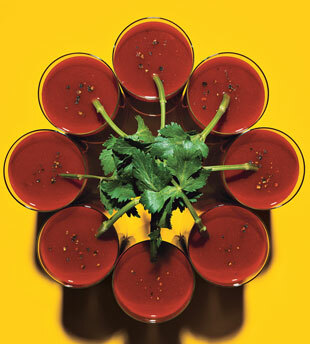 So let's embark on a Bloody Mary journey, shall we? Up first is Bon Appetit's curry-spiced version. Bon Appetit's take on the Bloody Mary steers away from spicy heat-wise, which is usually how I like my Bloody Marys, in favor of curry spice. The rest of the ingredients are pretty standard. And while it made for a beautiful beverage, I ultimately wanted something spicier. But, how does this relate to this Bloody Mary post? Well, when you spend twelve dollars on pickles, you kind of need them to be more than just pickles, and lo and behold, these were. See, we accidentally got the spicy variety of McClure's pickles and after checking out their website, we discovered that the leftover brine can be used as a Bloody Mary mix. Simply fill the pickleless jar of the vinegary, pepper-laden brine with tomato juice, shake and enjoy. I have to say, as tasty as the curry-spiced Mary was, the McClure one was one of the best I've ever had. You have to like a spicy Bloody Mary though. I mean, this drink is spiiicy, like I sort of felt like my stomach was going to die, but in a good way. Combine first 6 ingredients in large pitcher. Whisk in 2 teaspoons sea salt and pepper. Season with more salt, if desired. Cover; chill. DO AHEAD Can be made 8 hours ahead. Keep chilled. Whisk before serving. Fill tall glasses with ice. Pour in Bloody Mary mixture. Garnish with celery sticks. mmm... I want to try those pickles! You guys had a lot of bloody marys to drink! Must have been a fun day! I wish we had more of those pickles -- I also LOVED the McClure's Bloody Mary. Matt, were the pickles cleavers? Were they more like Wholey's pickles or more like Mast Farm General Store pickles? Based on my Internet research, it looks like the McClure's are very similar to the Mast General Store pickles. Yum! Yum! although my friend swears by wasabi powder. wow, Danielle. Thank you for being the FIRST PERSON to ever ask me that! hurrrah. we must be doing something right?? OK, so we use the Panasonic Lumix DMC-LX3. and I highly recommend it. Best camera I've ever had for sure. now i want a bloody mary. Let's put down the hammer, shall we? Thanks for the camera info. I'm definitely putting that on my wish list. Your pictures are awesome, as is your blog!